I used to think my daughter’s tantrums were my fault for being too soft on her, too coddling of this baby of the family. I tried to trace them to sugar or gluten or screen time, or some toxic combination of all three. I even wondered if they were related to the loud music I like to play in the car. Everyone kept telling me the fits were normal, and, yes, most parents have a story about a time when their kid went feral. That epic meltdown in the grocery store when you didn’t buy the gum, that time trying to tie her shoe in the parking lot. But at some point—when the fits didn’t subside after Viv’s toddlerhood; when they, in fact, escalated in number and intensity—I began to wonder if this behavior was indeed normal, whatever normal is. But let me back up. Let me not describe my daughter only in terms of her most troubling behavior. If I were asked about Viv, I would tell you that she is active and healthy and loves to ride her bike, that I have always been happy with the name we gave her—Vivienne, which means “alive” and makes me think of vivacious, which she is. I would say that she stands just shy of four feet tall (short for an eight-year-old) and weighs fifty-eight pounds. She’s in the third grade at the Village School, a Waldorf charter school, and she lives in the house where she was born, a small bungalow on a friendly corner not far from downtown Eugene. She has long dirty blonde hair that is prone to tangles that she hates brushing out, and a smile that crinkles up her face and her eyes to the point where it’s difficult to tell her eye color. She shares a bedroom with her eleven-year-old sister, whom she mostly gets along with. Her sister once described her as “my merry little buddy,” and that is an accurate description of how she inhabits the world. She likes playdates and card games and Roald Dahl books and chatting at the dinner table about her day. She likes the color pink and the color turquoise, and she prefers to wear soft clothes, many of which could pass as pajamas. I might mention that Viv was recently diagnosed with dyslexia. I might get emotional when I talk about the fits, or when one has just happened and I can’t get it off my mind, I might talk about them in a way that will make them seem bigger than they are. Because they’re the most challenging thing I’ve experienced in recent memory. I might tell you about the time she tried to get out of a moving car, or the time she chucked her bike helmet off the back of a moving bike, or about last year, when she threw a tantrum over not wanting to walk her bike down a hill I believed was too steep to ride. She and her older sister and I were a good half hour’s ride from home, and she was convinced she was going to ride on her own, starting with the hill. I had to corral her and get her off the bike and hold her in a parking strip until the fit subsided, during which she was thrashing and yelling and trying to bite me, totally unreachable with words, distraction, touch, or even bribe. This went on for fifteen minutes or so. I couldn’t reach my husband on his cell phone for his help. Eventually, a very kind stranger helped me hold on to her (it turned out he worked in juvenile corrections) and loaded our three bikes into the bed of his large pickup truck. The four of us rode across town then, side by side and unbuckled in the pickup’s cab, clutching our bike helmets and making small talk as if this were the kind of thing that happens every day. It’s hard to know what triggers Viv. She threw a fit once when I tried to make a last-minute change of plans and take her to a movie. We call this “clipping the wrong wire”—like when the protagonist in a suspense movie cuts the blue wire rather than the red one, and a building explodes. I might make these incidents sound funny because in hindsight some of them are, or to lighten the subject a bit so you don’t feel uncomfortable. We didn’t go looking for a diagnosis, but we stumbled upon one when we visited an educational support specialist while seeking help for Viv’s dyslexia. He asked us if Viv ever became out-of-her-head uncontrollable. Why yes, we said, how interesting of you to bring that up. He conducted a series of tests with Viv. He asked her to crawl. He asked her to stand very still with her eyes closed, moving her head up and down. He had her try catching a beanbag while also throwing a beanbag. He asked her to walk an imaginary line, heel to toe. After Viv did all that, as well as some written tests, and after he asked us some questions, the specialist told us that Viv has retained her Moro reflex. Before I explain the Moro reflex, I should mention that at this point my story might diverge from my husband’s. My husband, Bob, is suspicious of things he describes as “Eugene,” using the word as an adjective. That means tinctures and bodywork and the many, many, sometimes unconventional ways that people who live where we live seek to heal themselves from wounds of the past and present. Bob would probably tell you that we visited a man who has an office on the second floor of a school, and that the man did some tests with Viv, and as a result of the tests he believes that the Moro reflex is the reason for the fits, and then we wrote him a check and walked away with Bob wondering about snake oil. Though in the end, Bob agreed to give the treatment a try. I will admit that a part of me is like Bob, that I think a little doubt is a healthy thing. We were both vaguely skeptical but still hopeful that we might have found the thing that was causing our chipper girl to become unreachable at regular intervals. The Moro reflex is the startle reflex that most babies are born with. If you’re familiar with babies, you’ve probably seen the quick arms-up motion that is the baby’s way of protecting against sudden perceived danger. Most babies grow out of the reflex by the time they’re six months old. 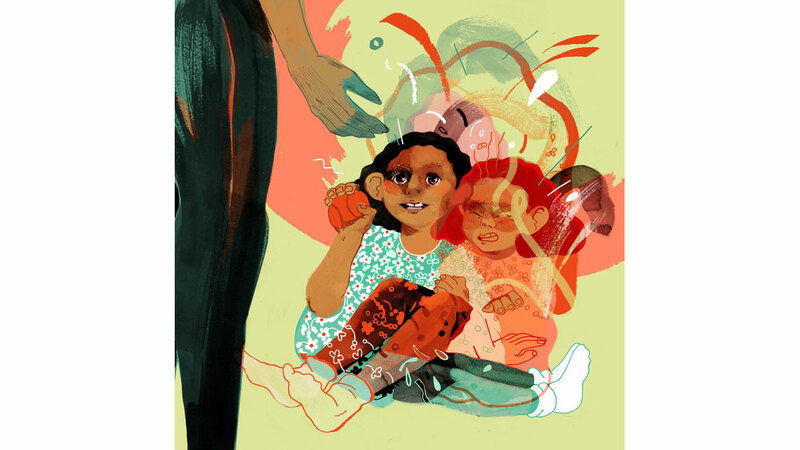 We’ve learned that if the reflex doesn’t go away, the child’s brain can’t discriminate between real threats and mild or nonexistent ones—so they’re constantly in fight or flight mode, their bodies flooded with cortisol. They startle easily, are easily overstimulated, and tend to be overly emotional. They overreact, are sensitive to light and sound and touch, and their behavior can be immature. One way to test the Moro reflex is to perform a trust fall with a person, asking them to stand with their arms dangling out in front of them. The person with a retained Moro reflex will probably startle, arms jerking to the side as they fall backward, while the person without the retained Moro reflex will just fall back into your waiting hands. The specialist first demonstrated the trust fall with Bob, who fell back gently into his arms. When he tried the fall with Viv, her arms jerked up, baby-style. To this day I’m still not sure if I would fall easily or flail, and I’m also not sure if I want to know the answer to that question. I don’t know why Viv’s Moro reflex has been retained or whether that’s the reason for her fits. No one knows the exact cause of Moro reflex retention but potential causes include premature birth, a traumatic birth, or the mother experiencing trauma while the baby is in utero or during her early months. One of my theories is that the emotional trauma I experienced because of my mother’s suicide, which happened while I was pregnant with Viv, undermined her healthy development. Though many have reassured me that it’s not my fault, and I recognize that it isn’t, it seems logical, even without knowing a whole lot about the brain, that the stress I carried was passed on to my daughter. It’s my gut feeling that this is what happened. Sometimes I wonder if Viv is acting out in ways that I couldn’t as a child, if what I’ve passed down through my genes is a giant flashing sign that says, “Let it out, kid!” I was quiet and bashful and tiptoed around my mother, who battled mental illness for much of her adult life. They say I never had the terrible twos because Mom was too sick at the time to handle it. I have very few memories of getting in trouble except for once when I was a teenager and came home drunk from a party on New Year’s Eve. I had my car taken away for a week. Except my mom needed me to run errands for her, so she just let me drive her car, which was nicer anyway. What I know is that we’re lucky to be able to think about all of this. We’re lucky to have the money for treatment, which is in the form of reflex inhibition exercises that Viv and I do together every day—or most days, anyway, when we can get it together to do them after breakfast. Whether the exercises work or not, we try them because we’re lucky to have the resources and patience and infinite, unconditional love for our child, even as her tantrums drive us to tears and sweat and rage at times, to a point where we can understand how someone with less restraint might hurt a child. If Viv’s retained Moro reflex goes untreated, it’s hard to say what will happen. Viv’s specialist talks about her having a diminished constitution or vitality. From what I’ve read online, it sounds like she would become another mildly stressed-out adult, someone who breaks easily under pressure, someone with a poor immune system who is prone to sickness. I wonder if I’m reading about myself, too, and about my mom, who was often sick, physically as well as mentally. I wonder about so many people I’m reading about who walk around with these burdens and try to avoid exploding. It reminds me of the school counselor I saw when I was in fourth grade, after a time when mom had been sick—kind, redheaded Mr. Sather, who told me to let it out like a balloon so I wouldn’t pop. Since we’ve been doing the exercises, it seems as though the fits have been happening less often, and the ones that do happen are less intense and easier to overcome. It’s hard to know if this is wishful thinking or if the exercises really are rewiring Viv’s brain. Before we began doing the exercises, the specialist told us they might cause a certain amount of regression. I was to look for things like crawling or thumb-sucking. Of course, Bob was skeptical about the exercises having any effect at all— until about two weeks in, when Viv began to experience some unusual attachment issues with me, weeping when we parted in the mornings at school, refusing to go on playdates, clinging to me at bedtime. I was simultaneously stressed about the clinginess and thrilled that something seemed to be happening. Bob found this development strange and curious. The behavior lasted for about six weeks. We’ve been doing the exercises for a year now, and I’m still not sure—not sure that the Moro’s the thing at the heart of Viv’s tantrums, not sure that the exercises are working or if we’re doing them as consistently and accurately and slowly as we should be, not sure of myself as a parent when she’s so out of control that she tries to tip over her dresser and all of the drawers go crashing to the floor, which happened last month. She’s getting stronger, and the fits, though not as frequent as they once were, seem scarier, the possibility always there that she could hurt herself by running into the street in front of our house when I can’t contain her. She never has tantrums at school, and never with anyone but me or Bob. Sometimes I wonder if we should be working on teaching her to better express her anger or frustration, if she wouldn’t save it all until the end of the day then—right after school is the most common time for a fit. I know it frustrates her that she can’t read as well as many of her classmates can. I heard last year that another child laughed at her when she tried to read in class. I know sometimes when she comes home from school, she’s just off—something happened during the day that bothered her. And then all I have to do is give her almond butter instead of the peanut butter she prefers, and it’s all over. This is not to say that there haven’t been bright spots in the process. We check in with the specialist about once a month to reassess and see where Viv is with the reflex inhibition work. Last spring, after a particularly successful couple of months of doing Viv’s exercises, it looked like the Moro had vanished. At the specialist’s office, she did the trust fall and her arms remained steadily in front of her, as they should with anyone whose Moro reflex went away when he or she was a baby. Whether this was the result of the exercises or the fact that she’d been practicing the trust fall at home with her sister, I’m not totally sure. But at the time, the fits were almost gone. We were ecstatic. We received a new set of exercises designed to work on related reflexes, and Viv hated them. After battling her daily to get her to do them, I called the specialist, seeking relief and wondering if maybe we could be done, if we had achieved what we set out to do. No, he told me, we have to see out the series of exercises, mysterious as it seems to us, or she would revert to the old patterns. This rewiring of the brain, it seems, is a long process—it’s supposed to take a year if you do the exercises every day, which we definitely haven’t. And, yes, I admitted, that makes sense. There’s no easy way out of this. Since then, we’ve cycled through four new sets of exercises, including one that Viv outright refused to do after a week because it was so tedious. We’ve come back to the initial exercises during the times when Viv’s meltdowns increase in frequency and intensity. We’re in one of those cycles now, and I, again, feel the promise of change and try to have faith that this is working. As I write this, it’s been six weeks since Viv has had a fit. And so these dark fall mornings, Viv and I save a little time before school to “play the flower game,” where she squeezes into a tight nighttime flower first, her neck tucked, her arms in an X across her chest, her legs crossed at the ankles. Then she opens up her legs and spreads them out while also moving her neck back and looking up. We do this, opening and closing, two times. I sit cross-legged next to Viv while she does the exercises and try to gently guide her in my best meditation-coach voice. I might do the exercises at some point too. It certainly can’t hurt. Jamie Passaro is a writer whose articles, interviews, and essays have been published in the New York Times, the Washington Post online's "On Parenting", the Atlantic online, and The Sun, among other places. She lives in Eugene with her husband and two daughters, runs an obituary writing business called dear person, and recently started working for Luminare Press. Great article. I was wondering if your daughter has been assessed for an Autism Spectrum Disorder? She sounds very similar to my ASD diagnosed 6 year old daughter.